This wholesome, all natural treat has the added benefit of coconut, oats and honey to provide your dog with a taste they love and the quality you can trust. 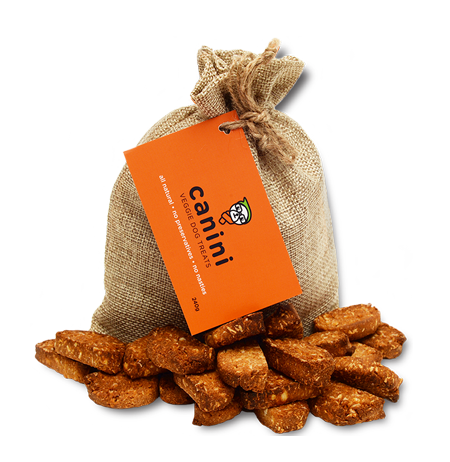 In the search for a pure and wholesome treat for dogs, Canini Veggie Dog treats have grown and developed into what they are today. Using only the finest ingredients, Canini Veggie Dog Treats have no preservatives or nasties and are a healthy treat that dogs love. We source organic ingredients to ensure this wonderful treat is pure and free from additives, making it ideal for allergy sufferers whilst maintaining a great taste and crunch that dogs love. Only the finest ingredients are used including organic coconut and organic buckwheat with a touch of honey. All of these have incredible health benefits for your dog. We have harnessed good old fashioned simplicity with highest quality ingredients to create a trusted healthy treat that is sought after by so many of us today. The vegetarian design of these dog treats provides your dog with essential vegetable matter whilst also being extremely kind to the planet. For further information or to see our upcoming market events, go to our contact us page.